The story of Meta and its Meta 2 augmented reality headset isn't over, there's a new development that could impact its ultimate fate. During the waning days of January, the US District Court of Delaware finally weighed in with an update in the patent infringement case against Meta, or whatever remains of the company in the hands of its new, undisclosed owners. In a filing made by the court clerk (the court's record keeper) on Jan. 29, the court stated, "It is hereby ordered that Defendant's [Meta Company] Answer is stricken and the Clerk of Court is directed to enter default against Defendant in this action. 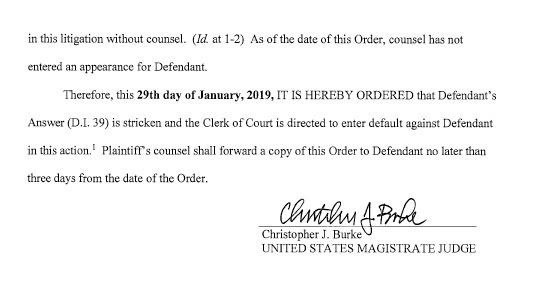 Plaintiffs counsel shall forward a copy of this Order to Defendant no later than three days from the date of the Order." Previously, Next Reality reported that Meta had until Jan. 24 to provide the court with the required new legal representation from its side in order for the patent infringement case brought by Genedics to continue. That date passed, and it seems the court even gave the owners of Meta's assets a few extra days to lodge a response. But that didn't happen, so the court has moved forward with the next phase of the case. Jan. 29 court order updating the Meta vs. Genedics patent infringement case. Based on the new ruling, at first glance, it would appear that the new owners of Meta's assets might have lost the rights to the patent in question, but it's not that simple. According the legal team representing Genedics, who spoke to Next Reality about the case, at least one more step needs to be taken on their side in order to secure a final win in the case. At least part of the effort by Genedics would involve filing a new motion with the court, which could later lead to a "default judgment" against the owner of Meta's assets. And while there's always the chance of a settlement or an appeal following any future judgment, both of those are difficult to speculate upon given the fact that the new owners of Meta's assets remain shrouded in mystery. Even Genedics' legal team has, as of this writing, admitted that they have no idea who the new owners are, which would make any backroom negotiations difficult. UPDATE: A report from Variety citing the transfer of patent rights indicates that the new owner of Meta's assets is a newly formed corporation called Meta View. However, on the contract documents, a person named Mayer Gniwisch is listed as the receiver of the assets. A quick web search indicates that Gniwisch is a general partner at Oliver Tree Ventures, an Israel-focused tech investment fund. Prior to the AR startup's insolvency, the VC firm listed Meta as one of its portfolio investments, so it looks like this buyer had an inside track the entire time. Whether the new owner decides to slice up the company's assets for other purposes, or move forward with the brand under new management, the patent infringement case, and its final outcome, will nevertheless have to be dealt with in the coming months.